Sen. Heidi Heitkamp (D., N.D.) is facing scrutiny for declining to push for prosecution of sexual and physical abuse at a school for troubled Native American students when she was her state's attorney general. Between 1993 and 1994, the North Dakota Bureau of Investigations looked into allegations of physical and sexual abuse at the Wahpeton Indian School, a boarding school for troubled Native American students, Fox News reports. Heitkamp denied not doing enough to prosecute, but former Department of Justice officials claim she could have done more. The allegations were "largely confirmed" by four state and federal investigations, according to the report. The allegations included a staff member who was dating a student and providing students with alcohol. That staff member was not fired. One student who claimed to be touched inappropriately by a staff member was ignored. Other allegations involved inadequate medical care for students and assault on a student by a staff member who had previously been convicted of felony assault against his wife before joining the school. After the state declined to prosecute, that same staff member went on to sexually assault a child and was convicted of that crime. Heitkamp denies not doing enough in response to the findings of these investigations. A spokeswoman for the senator said, "As the state’s top law enforcement officer, Heidi took all of the action within her jurisdiction, including recommendations to improve conditions at the school and has continued work for our Native communities in the Senate." A trial attorney and former Department of Justice official contradicted the assertion that Heitkamp did not have the ability to pursue prosecution because of her position. "A state attorney general is the lead law enforcement officer in the state," the source said. "If they want to bring a case, they are not going to be stopped by a county attorney’s recommendation." He added that many cases are not prosecuted out of fear of losing and hurting political futures. "You have to bully pulpit as the attorney general in the state," the source added. "You may not necessarily have direct authority to do something, but you can certainly go out and put pressure on local jurisdictions to prosecute cases." Washington attorney Josh Helton echoed those sentiments. "It would be very unusual for a state attorney general not to have broad investigative and prosecutorial discretion," he said. Heitkamp is up for re-election in November and faces stiff competition from Rep. Kevin Cramer (R., N.D.) who currently has a double digit lead over Heitkamp in the polls. 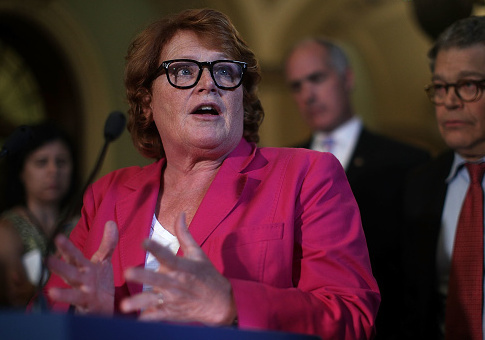 Heitkamp was considered a potential vote in favor of now Justice Brett Kavanaugh for his Supreme Court nomination since President Donald Trump won North Dakota by 36 points in 2016. Ultimately, she voted against Kavanaugh's confirmation, saying "Our actions right now are a poignant signal to young girls and women across our country. I will continue to stand up for them." This entry was posted in Politics and tagged Heidi Heitkamp. Bookmark the permalink.